About Bats: The most common colonizing bat species in Pennsylvania is the Little Brown Myotis. 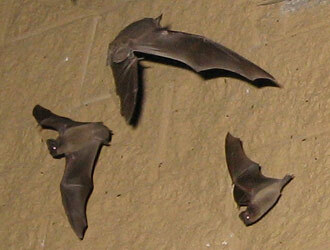 These bats have a habit of living inside the attics of homes, and can form very large groups of maternal colonies. Bats are good animals, and they eat a lot of insects, but when they roost inside buildings, they can leave a huge mess with their bat poop (guano), which can cause lung diseases in humans. We are experts at humane bat control, and never harm a single one of these winged wonders. Bats are a common nuisance animal in southeast Pennsylvania. In Philadelphia and Montgomery County, bat have become a particularly common problem, as they have invaded many homes in the area. If you need a professional solution for your Philadelphia bat problem, give us at A Wildlife Pro a call. Kris, Your site was very helpful. I have a colony of Little Brown Bats in my attic I have someone who could help me mount a repeater trap over the access point under my soffit (where the soffit netting is). Could you tell me where I could purchase a trap for bats like the one in your photo that can be mounted under the soffit? We already tried putting additional wood and a heavy duty metal grid over the old opening, but whatever was in the attic just pulled the netting back adjacent to the first hole. We had inserted some loose grid in this adjacent area behind the net and it is now nowhere in sight. I can't tell if the animal got out or back in, but there was a huge racket at that corner of the attic yesterday afternoon; we had only installed the grid less than 24 hours before. I'm pretty sure the problem is bats. I see many very active brown ones flying nearby in the day, starting at 6 am. I'm sending you a picture of the small turds that were on top of the vapor barrier over the attic access panel to see if you can help identify the type of bats. The animal had removed the entire fiberglass batting that had been attached to this vapor barrier. There were three other areas where fiberglass had been removed leaving a cavity that looked like a sleeping area. Also attached is a photo of the temporary fix that we attempted. I've also thrown ammonia soaked sock balls into the attic to try to encourage the bats to leave. And ran a talk tv show under the access door as loud as the speaker would go all afternoon and evening. Do you think this would scare them off? Do you have any other suggestions, including how to close the netting and whether to vacuum out all the blown in fiberglass insulation and replace it with batting? Thanks, Dan P.